Dump Fed Education . . .
. . . The 10th amendment of the U.S. Constitution dictates public education is a state issue. They should dismantle the U.S. Department of Education and help Arne Duncan find a real job. . . .
And like crack addicts, states and local school boards will do whatever is asked of them to get those federal funds. . . with the funds fostering policies and programs of questionable value while advancing the careers of those bringing in the $$$. Mr. Bottini correctly points to big businesses, the money they will make producing educational materials, and their influence over politicians as motivation for the federal involvement . . . But I believe there is more. With Federal Funds comes a Federal Agenda a/k/a Federal Control over what is in the hearts and minds of our children. Give them a few more years and control over the nation's populace will be a snap! Given the state of public education today, can anyone really say that it is better today than 40 to 50 years ago when there was minimal federal involvement? Public education these days is less about giving students knowledge and more about telling them how to think. While there will be short-term withdrawal pains, we'll all be better off if funds for Federal education programs get cut off. Mrs. Pelosi should be denied Communion until she changes her advocacy views on abortion, Cardinal Raymond Leo Burke said, according to the Western Center for Journalism. I wondered when someone from the Church would finally set Mrs. Pelosi straight on Church doctrine since she had gotten into a habit of twisting things around to fit her political agenda. The OD's View: Parochial walls must come down. The smoldering tiff between the Utica Common Council and a committee that recommends federal funding for nonprofits once again puts an accent on the embarrassing parochialism that can threaten growth in our community. . . In this case, the flames are being fanned by the age-old city residency argument. . .
Hopefully the people that might be considering setting up a multi-billion dollar computer chip operation here aren’t watching all this. It’s theater of the absurd. . . .
To believe that someone from outside one set of lines doesn’t care about what happens across those lines is just plain silly. What's silly is OD's claim that city officials believe that people from outside don't care about what happens in the city. Untrue! The city has long recognized that "outsiders" care and invited them in to help -- e.g. the Utica Master Plan steering committee which had several non-residents among its members. What is absurd is the OD's position that residency requirements are not relevant. If that is the case, let's get rid of the residency requirement for mayor . . . or how about New Hartford town supervisor? . . . . Yes, those suggestions are ridiculous. Even though someone in Utica "cares" about what happens in New Hartford (because NH's decisions have caused increases to Utica's tax, sewer and water rates) NH would not allow a Utican to run for town supervisor. The laws contemplate that municipal officials have "skin in the game" by being resident within the municipality. 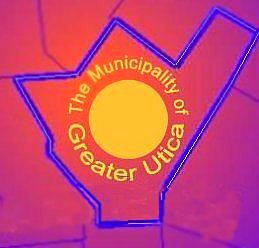 If Utica is forming a committee to distribute public funds to city projects, it is Utica's prerogative to limit participants to residents who will live with the consequences of their decisions. "Caring" is not enough. It is interesting that it is always Utica that is on the receiving end the OD's cries of "parochialism." The "parochial walls" always operate one way, favoring suburban interests. If the OD is seriously interested in eliminating "parochialism," it would advocate ridding ourselves of multiple municipal boundaries that allow suburban jurisdictions to accumulate wealth at the expense of city residents. Somehow I do not think the OD is ready for this. Until the OD stands for a true merger of city and suburban governments, it should be ignored. Utica: Letting Others Do Its Planning . . .
OD Today: Carl's Furniture City closing its doors. Another loss of a taxpaying business from the City of Utica! . . . In hardscrabble West Utica no less. . . While only Carl knows the real reason or reasons for closing his doors, the closure of his store should come as no surprise. As this blogger noted back in 2011 in a post about the Utica Common Council's seeming lack of interest in determining the true impacts of the N-S Arterial Project . . . The Council is apparently prepared to allow huge swaths of properties to be removed from what should be in private hands and have them turned over to highway use. That guarantees that they will never be the site of economically productive activities . . . never create jobs or wealth . . . and never generate a dime of tax revenue for the financially-strapped City of Utica.
. . . no attempt is made to estimate the potential revenue loss that can be expected to result from the change in traffic patterns when Sunset Ave. and Warren St. are cut off. Businesses, such as Carl's Furniture, will lose customers when they become difficult to reach and the city will lose sales tax. This did not have to happen this way, but it was too easy to let the State do all the planning for its highway with the city just there to "tweak" the plans with suggestions on whether the retaining walls should have ivy covering them or not. The City never had a real plan for the surrounding West Utica neighborhood . . . So the State's arterial plan became West Utica's plan. Something similar is happening in the Utica Harbor. While the new Holiday Inn Express is a lovely addition to the neighborhood and it is touted as part of the Utica Harbor development, the hotel is surrounded on three sides by a tall white privacy fence that separates it from the Harbor. The hotel developer, no doubt, looked at the location near the thruway exit and downtown and thought it was an ideal place for a hotel ... but the harbor played no role in it, otherwise why the privacy fence? At the Harbor, it looks like individual developers are doing their own planning with no overall view to relate the private developments to each other. If the nanocenter becomes a reality, the prediction is 5,000 jobs there plus another 15,000 spinoff jobs. That represents a lot of new money and new people coming into the area. Where will they go? Will they create more cookie-cutter sprawl into Marcy, or will they come into Utica to recreate a vibrant, interesting city? These new people are the "creative class" and will naturally gravitate to a dense diverse urban environment because it is more stimulating. If Utica is not ready with a vision where the new arrivals can see a place for themselves, they will build anew elsewhere. Nano: Finally Getting It Right! Officials with the Mohawk Valley EDGE have travelled the globe time and time again in attempts to lure a chip-fab manufacturing plant to the Marcy Nano site at SUNYIT. In the end, the end user came...from Albany. The problem for years has been that an end user would not commit to the site without a wetlands permit in place, and the Army Corps of Engineers wouldn't grant the permit without an end user committed. But now, the EDGE has announced that CNSE, the College of Nanoscale Science and Engineering in Albany, will act as the committed end user; a developer, really, to build a 450 mm manufacturing facility on SUNYIT property in Marcy. Here's why, for the first time, I think the NanoCenter project is going to succeed. (1) The "Big Guns" have been brought in . . . In this post from a year ago I said the following about the elusive federal wetlands permit . . . EDGE and the County need to turn this problem over to Big Guns who are better equipped to deal with the Federal government and have as much, if not more, at stake: the State of New York. . . . The State has environmental expertise, has working relationships with the Federal environmental agencies, and even has a potential to assume some of the federal authority in certain circumstances. Marcy NanoCenter is beyond local capabilities to pull off. Bringing in the CNSE as developer is bringing in the "Big Guns." These guys have a track record of success. (2) The Feds finally have a credible "end user" of the site that they can hold accountable . . . Frankly, if I was the Army Corps I probably would not issue a final permit either. With the "wheels within wheels" approach, just whom would the Army Corps hold accountable to ensure that all permit conditions are complied with? SUNYIT? EDGE? Fort Schuyler Management (with no track record, no assets, and no individual co-signers to secure performance)? An unknown developer or tenant for the site? There are too many players involved for the Army Corps -- or we the taxpayers -- to keep track of. With CNSE as developer, the Federal Army Corps of Engineers only needs to deal with one entity, CNSE, that will have control over the site. In the end, the situation becomes somewhat similar to the shopping centers which have obtained ACE wetlands permits without securing tenants. EDGE could not credibly substitute as a "shopping center" developer . . . but CNSE can. Obama/Clinton/Kerry's Total Failure foreign policy . . .
County Mission Creep . . .
OD: $500,000 could be available for flood mitigation in Oneida Co. The problem, Mr. Picente, is not "flaws in creek beds and streams," but, rather, flaws in Town-level decision making on where to allow development and the form that the development should take. New Hartford's now-legendary storm-water problems are self-induced ... created by allowing development in the wrong places, allowing developers to get away without mitigating the impacts of their developments, and taking monies reserved for addressing adverse impacts and using them to foster more development. Town of New Hartford government and its cronies have benefited richly from the development, induced by cutting corners, in the form of tax revenue and reduced development costs. The Town's taxpayers, meanwhile, have had to fork over millions to fix storm water problems created by poorly regulated development in the past only to see new developments create new problems. And now the richest municipality in Oneida County will soon have help from ALL County taxpayers? Lines need to be drawn as to what level of government is responsible for what service. Storm water management has always been the responsibility of the local municipality because the local municipality has direct control over development. Not allowing development in harm's way, and not allowing development that creates runoff and harm to others, eliminates the need to fix "flaws in creek beds and streams." The County should not ding all its taxpayers to reward poor decision making on the Town level. Something Perverted About This . . .
Jeb Bush to award Hillary "Liberty Medal" on eve of Benghazi anniversary. Regardless of party, the New World Order takes care of its own. Almost 3 years ago it was Chinese Garlic that got me thinking about trade policy and gave me a big case of agita. Now it's the prospect of importing Chinese Chicken that is making my stomach turn! What are our bureaucrats thinking of? In the name of free trade we give a potential enemy the means of attacking us biologically ... Sorry ... We have the means internally to satisfy our need for chicken and do not need to take this risk. This is a failure of our system of narrow-focus administrative agencies that cannot or refuse to comprehend the bigger picture. It's not in their job description. And Congress, which has the power to do something about this, is either bound by their political ideologies and allegiances or entirely missing in action. No one protects ordinary citizens any more. "The actions of the Syrian regime against its own people are heinous and go against all tenets of human decency. . . ."
Our congressman has apparently already accepted as fact that the Assad government has gassed its own people. . . . But based on what? . . . John Kerry's say so? (A lot of Vietnam Vets wouldn't trust this guy.) Do we know for sure that rebel factions are not responsible? Can this administration be trusted to give truthful and accurate information to Congress and the American People? Did a "You-Tube Video" cause the Benghazi attack? . . . I don't think so. "The American people need to know that any potential action in Syria would help achieve clearly-defined, limited and attainable policy goals that further U.S. interests in the region." You said a mouthful there, Mr. Congressman! What "clearly-defined . . . policy goals" will be achieved? What U. S. "interests" will be furthered? Please identify the goals and interests to your constituents. Can this administration be trusted to give a truthful portrayal of "policy goals"and "interests" to Congress and the American People? What "policy goals" and "interests" have been advanced in Libya? What "policy goals" and "interests" have been advanced in Egypt? Are they American "policy goals?" Are they American "interests?" It seems that the only goals and interests getting advanced have been those of the Muslim Brotherhood . . . which has led to slaughter of Christians and burning of churches. No surprise here . . . when James Clapper, Director of National Intelligence, essentially described the Muslim Brotherhood as a bunch of "good guys." Mr. Congressman, you are not nearly skeptical enough!